Is America a nation like any other, with a past marked by injustice and oppression? Or is America a shining city on a hill, marked by exceptionalism, one where the lamp of liberty and democracy burns brightly? Dinesh D’Souza has written What’s So Great About America to respond to America’s critics, who deny that there is anything unique about America. These critics include multiculturalists who allege historical racism and the oppression of minorities, Western leftists who see America as a force of evil, Third World intellectuals who deplore the legacy of colonialism, and Islamic fundamentalists who view America as culturally decadent and morally corrupt. 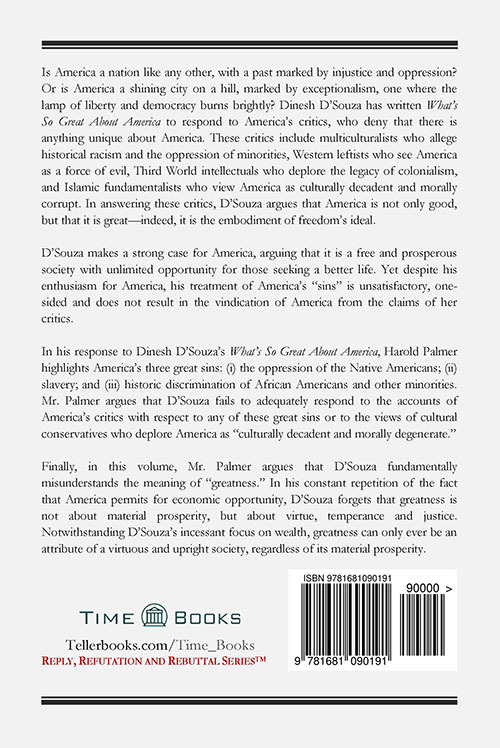 In answering these critics, D’Souza argues that America is not only good, but that it is great—indeed, it is the embodiment of freedom’s ideal. D’Souza makes a strong case for America, arguing that it is a free and prosperous society with unlimited opportunity for those seeking a better life. 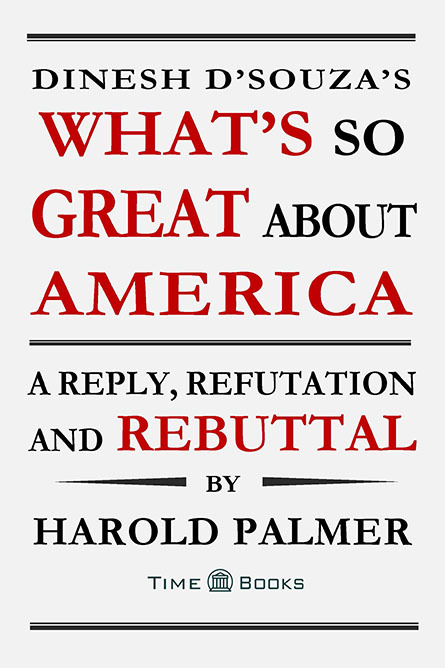 Yet despite his enthusiasm for America, his treatment of America’s “sins” is unsatisfactory, one-sided and does not result in the vindication of America from the claims of her critics. 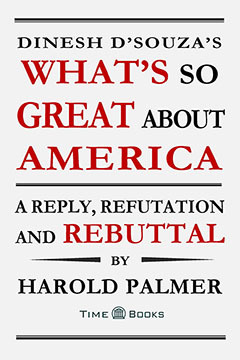 Finally, in this volume, Mr. Palmer argues that D’Souza fundamentally misunderstands the meaning of “greatness.” In his constant repetition of the fact that America permits for economic opportunity, D’Souza forgets that greatness is not about material prosperity, but about virtue, temperance and justice. Notwithstanding D’Souza’s incessant focus on wealth, greatness can only ever be an attribute of a virtuous and upright society, regardless of its material prosperity. The Reply, Refutation and Rebuttal Series™ of Time Books™ publishes monographs and treatises that reply to contemporary perspectives on political, philosophical and religious issues.